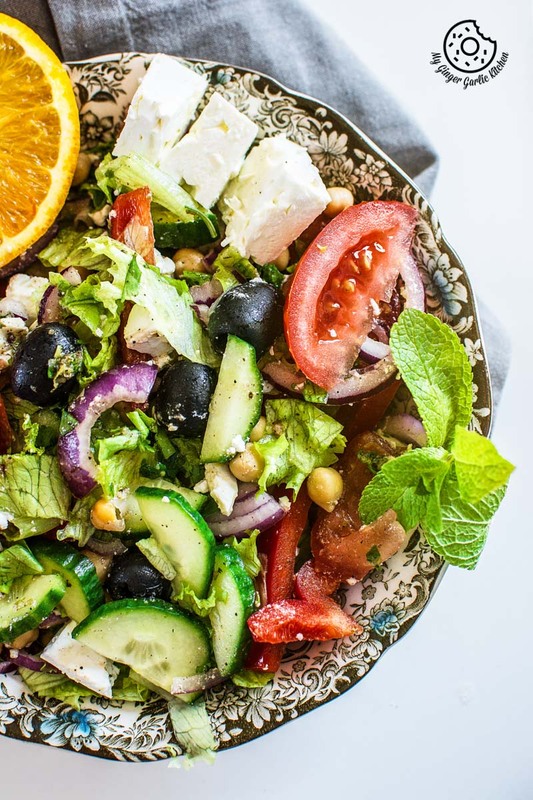 This Greek Style Chickpea Feta Salad With Lemon Garlic Dressing is the beauty you surely want to try this summer. This salad is excellent for a light meal, particularly on a warm/hot day. Plus, it’s healthy and full of fresh and bright summery flavors. Happy Friday! How was this week for you? Mine started with little hiccups (due to sickness), but later it hit the pace. Yesterday, it was really hot here like an ideal summer day should be. And I surely didn’t want to miss the chance to enjoy it outside. Thus I pushed myself and we managed to go on our first beach trip of this season. Little ‘A’ really enjoyed in the water. Even though I didn’t go in the water, I fully experienced my share of soaking the sun. It felt really good. Summer spirit is alive and beach restaurants are offering a variety of summer salads. So yesterday, I savored a delicious Greek Salad on a beachside restaurant. Greek salad for me, and pizza for little ‘A’ — win-win for both of us. Yesterday, it was hot, and today it is super windy and kinda cold again today. Now you could easily image about why I am so glad that we went out yesterday. 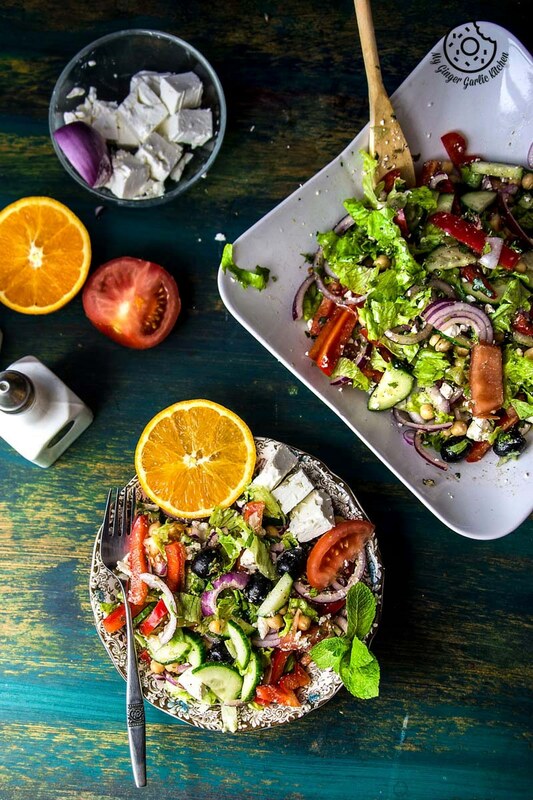 Even though it is not sunny today, but again I am longing for this pretty Greek-inspired salad. That’s how much I love it. 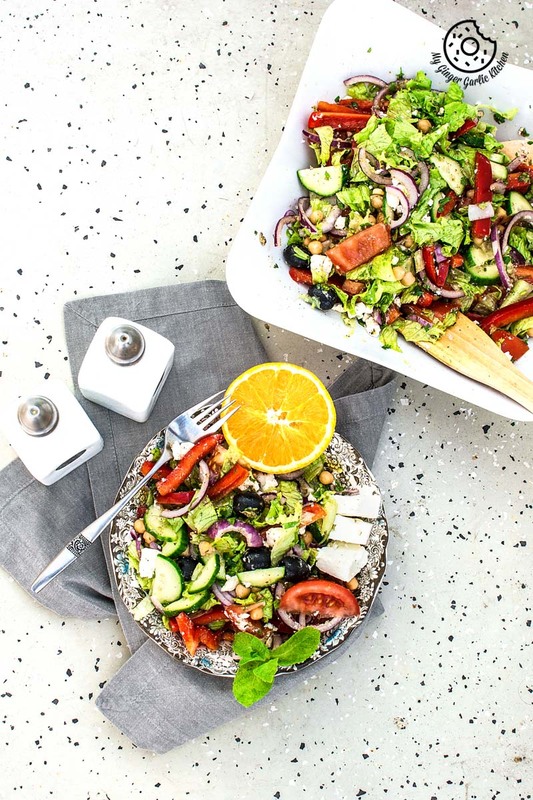 I shot the video of this bright, fresh, traditional Greek inspired Salad recipe with a perfect homemade Greek style lemon-garlic salad dressing last month but didn’t get the chance to share it and today it feels like a perfect day to share this. 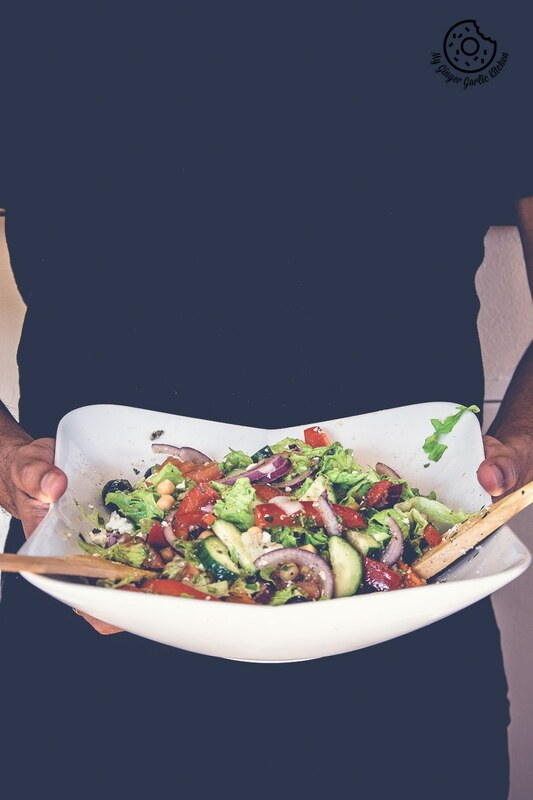 Have you ever met anyone who doesn’t love Greek salad? Well, if you ask me, I haven’t. I am craving for this salad, and luckily I have almost all the veggies at home. I will just have to go out to buy some good feta cheese. So this salad is on my dinner menu today. Again the same kind or arguments about feta cheese. Some say feta should be added as a block on top of the salad and other say it should be crumbled on top — that’s the real Greek way. I make my salad with both methods, but for this recipe, I chose the crumbled version. Actually, I haven’t been to Greece so I can’t claim anything here. I only believe in what I see. And I add lettuce to my Greek salad most of the times because that’s the only way I have had it in the restaurants and also I love lettuce a lot. No offense, but if you think that lettuce is not added to the traditional Greek salad, then please feel free to discard lettuce from this recipe. This bright salad is full of everything I love — veggies, chickpeas, and feta for that perfect salty cheese punch. Whipping up this salad is incredibly quick and simple. It doesn’t require the fine chopping, everything is cut into big chunks for this salad. This summer salad is made with fresh ingredients and is really palatable. Lemon, garlic and herb dressing makes this Greek-inspired salad more inviting. This would make a great side dish for your summer get-togethers. 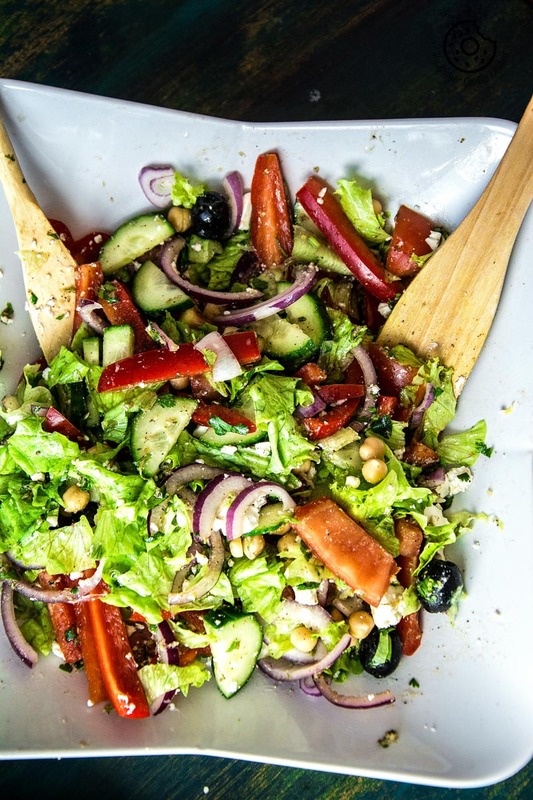 Summer is the perfect time to consume all those fresh vegetables and this Greek-inspired salad requires many of them. This is perfect for making on a weekend or a weekday night. 1. Add lettuce, chickpeas, cucumber, onion, tomato, olives into a large bowl. Toss well and set aside. 1. In a small bowl, combine all the ingredients for the dressing, give it a good mix. Adjust the salt and pepper according to your taste. 1. Just before serving the salad, drizzle the dressing over fresh vegetables and sprinkle crumbled feta cheese and toss one more time. 2. Serve on a plate and sprinkle with more feta cheese. Enjoy!